PERSAX S.A., created as the result of the merger of several blind manufacturers, has been operating since the 1950s. The company originally manufactured PVC profiles, an area that became one of its main areas of business and a market benchmark. PERSAX has great capacity to adapt to customers' requirements and to ideosyncracies of all the markets where it operates. The extensive range of solutions available, coupled with its capacity for personalisation and regulatory compliance, allow PERSAX to offer specific solutions. In short, our organisation is defined by a constant search for customer satisfaction through continuous adaptation and improvement of our product. Close contact with our customers is essential to us, which is why we have a team comprising 200 people and four regional offices in Zaragoza, Palencia, Huelva and Seville. On an international level, we have two regional offices in Mexico and Croatia, as well as a significant network of distributors. Close contact with our customers is essential to us, which is why we have a team comprising 200 people and four regional offices in Zaragoza, Palencia, Huelva and Seville. 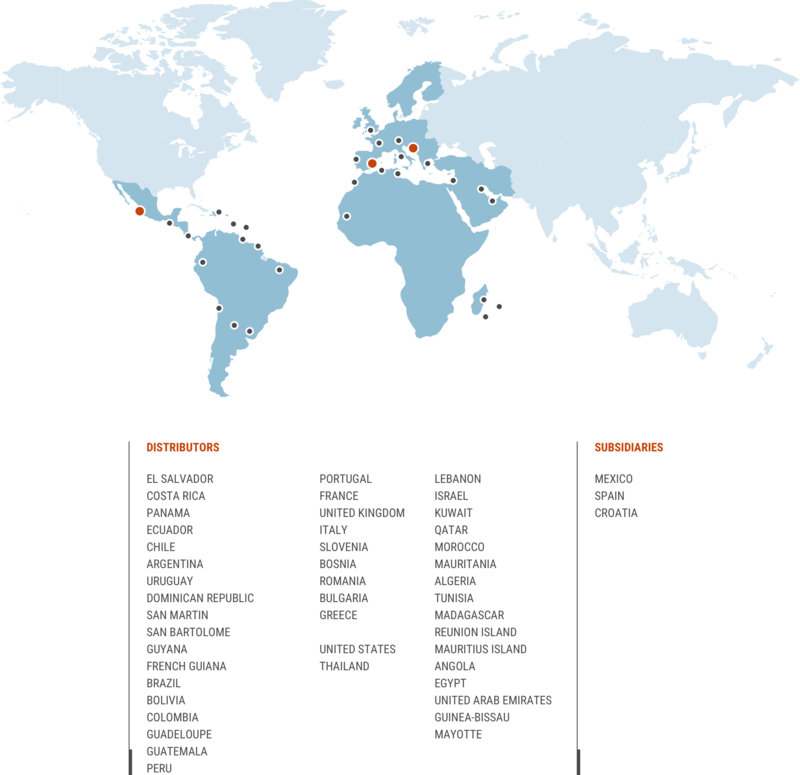 On an international level, we have two regional offices in Mexico and Croatia, as well as a significant network of distributors. We pay great attention to traceability throughout the production process, from placing the order through to delivery. All this in compliance with the strict quality controls required under ISO 9001. Internationally, our marketer spirit begins in the 1980s, through expansion into neighboring countries such as Portugal, France and North Africa, continuing 90 with Latin America. Sustainability and respect for the environment have always been built into our products: insulation, energy savings and energy efficiency are aspects that define our windows. Persax has an R&D+I Department made up of a team of engineers and architects who continually analyse market trends and carry out important research and product innovation tasks. Persax guarantees that its production system is subjected to exhaustive controls. From the moment your order is placed through to delivery, the process is backed by AENOR with international certification ISO 9001 (IQNET). Additionally, our products are subjected to a series of tests such as Resistance to Wind Load, Thermal Transmission, Acoustic Insulation and Permeability to water, among others. This enables to guarantee the correct functioning of our systems. To succeed with our mission, Persax has an R&D+I Department staffed by a team of engineers that continuously monitors market trends, performing important research and innovation work, always with a particular focus on quality control. This is evident in the choice of raw materials and the technologies used in our production processes. Our internationalization process started in the eighties when we started operating in our neighbouring countries that share a culture and climate that requires protection from the sun. Our international growth continued slowly but surely, until in 2008 we opened a new international office in Croatia and another in Mexico in 2009. Distributing directly and through regional offices since the foundation of the company, our own distribution fleet and sales force enable Persax to maintain close relationships and provide speedy services. Persax is committed to the environment. That's why we stopped using lead and cadmium in our PVC seven years ahead of the enactment of the European regulations that restrict the use of these substances. Persax stopped using them in 2008, while EU regulations committed to reducing these stabalisers in 2015. We have replaced these compounds with Ca / Zn stabilisers which are not classed as toxic or dangerous. They are less harmful to the environment and are not hazardous to our employees' health. Persax is concerned about the social impact of our activities. Among our Corporate Social Responsibility Activities is our agreement with textile company A Puntadas. When we learned of the work done by this company to train women at risk of social exclusion in textiles manufacturing, Persax decided to donote our canvas remnants to the company for use in training activities and sewing workshops.